McCune-Albright syndrome in an 18-month-old female patient: A case report. Department of Pediatrics, King Abdulaziz University Hospital, Saudi Arabia. Background: McCune Albright syndrome (MAS) is a rare disorder caused by an activating mutation of the stimulatory G-protein alpha subunit (Gsα) gene. The disease is characterized by polyostotic fibrous dysplasia, café-au-lait skin pigmentation, and precocious puberty. When at least two key symptoms are present, the diagnosis of MAS is confirmed. We report the first case of McCune Albright syndrome in Saudi Arabia. Case presentation: An 18-month-old female infant was brought to the pediatric endocrine clinic because of vaginal bleeding for the first time, with all characteristics of menstruation. There was no bleeding from any other orifices and no history of trauma or child abuse. The mother noticed skin pigmentations and that her child was growing faster than her siblings. There was history of limping on the left side at the age of 14 months. On examination, the patient had normal vaginal orifice with intact hymen, bilateral enlargement of the breasts with no pubic hair present and café-au-lait macules on the trunk. All the laboratory findings were normal except an elevated estradiol, decreased serum phosphate, and elevated liver enzymes. Pelvic ultrasonography revealed a unilateral ovarian cyst of the right ovary. The bone scan showed abnormal uptake at the left proximal femur and acetabulum. The confirmatory genetic analysis was not available. The patient was treated with (Letrozole) and bisphosphonate therapy. The patient also received phosphate supplements. Conclusion: Although McCune-Albright syndrome is a rare sporadic disorder, the diagnosis should be highly suspected in cases of vaginal bleeding in young female patients. The manifestations of fibrous dysplasia occured at 14 months which was earlier than other reported cases occurred at 14 months which was earlier than other reported cases. McCune-Albright syndrome, Fibrous dysplasia, Café-au-lait skin pigmentation, Precocious puberty. McCune Albright syndrome (MAS) is a sporadic disorder caused by a mutation in the GNAS gene, which is the gene responsible for the production of the alpha subunit of the G protein (Gsα) involved in signaling pathways . It was first described by McCune and Albright between 1936 and 1937 [2,3]. MAS is characterized by the triad of polyostotic fibrous dysplasia (PFD), café-au-lait skin pigmentation, and a wide range of endocrinopathies including precocious puberty (PP), hyperthyroidism, growth hormone excess, hypercortisolism and hypophosphatemia . The clinical phenotype is highly variable among MAS patients due to the mosaic distribution of the mutation throughout various body tissues . A diagnosis of MAS is confirmed when at least two of the main symptoms are present . Here we describe a case of MAS in an 18-months old female infant who presented with fibrous dysplasia, skin pigmentation, precocious puberty, and hypophosphatemic rickets. An 18-month-old female infant was brought to the pediatric endocrine clinic because of vaginal bleeding for the first time with all the characteristics of menstruation. The bleeding was moderate with a bright brown color and clots. There was no bleeding from any other orifices and no history of trauma or child abuse. There was no history of hormonal exposure as well. The mother noticed multiple skin pigmentations on her daughter's body, and she was growing faster than the other siblings. The patient also started to complain of limping on the left side associated with bone pain and falling at the age of 14 months with no evidence of clinical and radiological fracture. A physical examination revealed that her height (80 cm) and weight (10 kg) were at the 50th percentiles. The patient had a normal vaginal orifice with an intact hymen and no evidence of bruises or lacerations. Bilateral enlargement of the breasts was also noted (stage B2 according to Tanner score) with no pubic hair. Café-au-lait macules with irregular borders and diameters of 3×6 cm, 3×1.5 cm, and 3×2 cm were present on the trunk, but did not cross the midline (Figure 1). Upper and lower limb examinations were normal with no evidence of leg length discrepancy. She was admitted for investigations and management. Figure 1: Café-au-lait macules of an 18-month-old girl with McCune–Albright syndrome (MAS). A complete hormonal panel, liver function tests, and serum electrolyte levels were performed to evaluate the patient (Table 1). Table 1: Laboratory Data of An 18-month-old Girl with McCune–Albright Syndrome (MAS). Pelvic ultrasonography was performed and revealed a unilateral ovarian cyst of the right ovary measuring 2.8×2.3 cm (Figure 2). Although a skeletal survey was done and no abnormalities were detected, a bone scan was performed to confirm the diagnosis of PFD. It showed abnormal uptake of the left proximal femur and acetabulum (Figure 3). 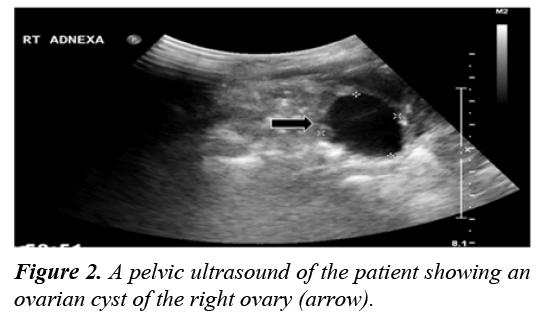 Figure 2: A pelvic ultrasound of the patient showing an ovarian cyst of the right ovary (arrow). 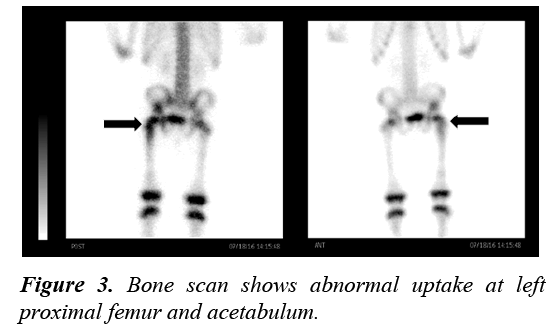 Figure 3: Bone scan shows abnormal uptake at left proximal femur and acetabulum. Echocardiogram (ECG) and echocardiography (ECHO) were performed to rule out any cardiomyopathies. Both ECG and ECHO were normal. The confirmatory genetic analysis was not performed due to the lack of such facility. However, the history, physical examination and laboratory findings were consistent with the diagnosis of MAS. The patient was started on an oral third generation aromatase enzyme inhibitor (Letrozole) with complete suppression of her precocious puberty. Bisphosphonate therapy of intravenous zoledronic acid was given (0.05 mg/kg/dose) as cyclic therapy to reduce bone pain and the risk of future fractures associated with PFD. The patient received phosphate supplementation and one alpha hydroxy vitamin D for associated hypophosphatemic rickets. During her follow up at the pediatric endocrine clinic for the last 1 year, there was no more vaginal bleeding or any pubertal manifestations. Her bone pain became milder but persisted despite cyclic bisphosphonate therapy as expected. Her hypophosphatemic rickets was completely resolved but she is still on prophylactic doses of medications. The three main manifestations of McCune Albright syndrome are polyostotic fibrous dysplasia of the bone, café-au-lait skin pigmentation, and endocrine dysfunction including peripheral precocious puberty, hyperthyroidism, growth hormone (GH) excess, hypophosphatemia and Cushing syndrome . In very rare occasions, other organ systems may be involved such as the liver, heart, parathyroid glands, and pancreas . The patient’s development of two key symptoms confirmed the diagnosis: fibrous dysplasia of the bone was the main symptom, and café-au-lait skin pigmentation and/or precocious puberty was the other [4,6,7]. There is a well-known variation in the presenting features of McCune-Albright syndrome (MAS) due to the mosaic distribution of mutation in body tissues . Precocious puberty is the most common endocrinopathy in McCune-Albright syndrome and is more common in girls than boys . It is identified by vaginal bleeding, increased breast size, and the development of ovarian cysts [4,6]. In a Korean study of 14 patients with MAS, all female patients showed peripheral PP at onset, and three patients subsequently developed central PP . Similar findings were stated in a case report from Iran . Precocious puberty usually presents before the age of four years and can be as early as 3 months of age . Another study showed the signs of PP developed at 2.2 ± 1.3 years (0.1-4.5) presenting with vaginal bleeding and breast development in 21 and 7 subjects, respectively . A third-generation aromatase enzyme inhibitor (Letrozole) is used to treat PP in girls . Here, an 18-month-old female infant presented initially with all PP signs including vaginal bleeding, breast development, and unilateral ovarian cyst. The patient was treated with Letrozole. The café-au-lait spots are common and usually present at or shortly after birth . Café-au-lait spots in MAS are irregularly bordered macules and do not cross the midline [5,11]. It occurs due to the influence of activating mutations of Gsα gene in the melanocytes, which increases the level of melanin production in the skin . Here, the patient had café-au-lait spots with irregular borders and different sizes present on the trunk. Fibrous dysplasia (FD) is defined as "a pathologic condition in which normal bone is altered by abnormal fibro-osseous tissue, causing distortion and overgrowth of the affected bone" . It can present with bone pain, fractures and deformities . A study by Hart et al. revealed that clinically significant bone lesions in FD are detectable at an age of 10 years. In an Iranian case report, the age at onset of FD was 5.5 years . In addition, Pauliina et al  reported the median age at which the first symptom of FD developed was 2.7 years while the diagnosis is typically made at 3.6 years. The onset of FD occurred at 14 months which was earlier than other reported cases. Several studies demonstrated the association between MAS and other endocrinopathies such as hyperthyroidism, hypophosphatemia, Cushing syndrome, and GH excess [6,15,16]. Sallum et al. identified 26 cases of hyperthyroidism among 85 MAS patients. Our patient had no evidence of hyperthyroidism with normal thyroid function tests. Approximately 50% of MAS cases have renal phosphate wasting. However, hypophosphatemia may or may not occur . A Korean study reported that 2 of 14 patients with renal phosphate wasting and hypophosphatemia had no evidence of rickets on X-ray results. Those patients received phosphate supplements . In this case, the patient had renal phosphate wasting with evidence of hypophosphatemia and therefore received phosphate supplements. In 2017, a study conducted by Yao et al. revealed that 13 of 52 patients with MAS had GH excess that resulted in more skeletal lesions especially in the craniofacial bones. Moreover, these lesions led hearing and visual problems. Therefore, it is important to run laboratory screening for GH excess in patients with craniofacial FD . Few MAS patients suffer from Cushing syndrome (7.1%) with differences in natural history ranging from spontaneous resolution to the need for adrenalectomy or even death . Non-endocrine organs can also be affected . A French study showed that 6 of 19 patients diagnosed with MAS had hepatobiliary or pancreatic lesions. Lesions were inflammatory/telangiectatic hepatic adenomas, choledochal cyst, and intraductal papillary mucinous neoplasms of the pancreas. In addition, hepatitis was present during infancy and tended to persist in a mild form . During childhood, severe gastroesophageal reflux and/or gastrointestinal polyps were also recorded . In this case, only the altered liver enzymes values were noted. Although McCune-Albright syndrome is a rare sporadic disorder, the diagnosis should be highly suspected in cases of vaginal bleeding in young female patients. The manifestations of fibrous dysplasia occured at 14 months which was earlier than other reported cases occurred at 14 months which was earlier than other reported cases. Weinstein LS, Shenker A, Gejman PV, et al. Activating mutations of the stimulatory G protein in the McCune-Albright syndrome. N Engl J Med. 1991;325:1688-1695. McCune D. Osteitis fibrosa cystica; the case of a nine year old girl who also exhibits precocious puberty, multiple pigmentation of the skin and hyperthyroidism. Am J Dis Child. 1936;52:743-47. Albright F, Butler AM, Hampton AO, et al. Syndrome characterized by osteitis fibrosa disseminata, areas of pigmentation and endocrine dysfunction, with precocious puberty in females: report of five cases. N Engl J Med. 1937;216:727-746. Rostampour N, Hashemipour M, Kelishadi R, et al. A case of atypical McCune-Albright syndrome with vaginal bleeding. Iran J Pediatr. 2011;21:399-403. Pratt V, McLeod H, Dean L, et al. Medical Genetics Summaries Bethesda (MD): National Center for Biotechnology Information (US) 2012. Collins MT, Singer FR, Eugster E. McCune-Albright syndrome and the extraskeletal manifestations of fibrous dysplasia. Orphanet J Rare Dis. 2012;7:S4. Cho E-K, Kim J, Yang A, et al. Clinical and endocrine characteristics and genetic analysis of Korean children with McCune–Albright syndrome: a retrospective cohort study. Orphanet J Rare Dis. 2016;11:113. Mieszczak J, Eugster EA. Treatment of precocious puberty in McCune-Albright syndrome. Pediatr Endocrinol. Rev 2007;4:419-422. Estrada A, Boyce AM, Brillante BA, et al. Long-term outcomes of letrozole treatment for precocious puberty in girls with McCune–Albright syndrome. Eur J Endocrinol 2016;175:477-483. Feuillan P, Calis K, Hill S, et al. Letrozole treatment of precocious puberty in girls with the McCune-Albright syndrome: a pilot study. J Clin Endocrinol Metab. 2007;92:2100-2106. Raus I, Coroiu RE. McCune Albright syndrome-association of fibrous dysplasia, café-au-lait skin spots and hyperthyroidism–case report. Clujul Med. 2016;89:559-564. Fusconi M, Conte M, Pagliarella M, et al. Fibrous dysplasia of the maxilla: diagnostic reliability of the study image. Literature review. J Neurol Surg B Skull Base. 2013;74:364-368. Utriainen P, Valta H, Björnsdottir S, et al. Polyostotic Fibrous Dysplasia With and Without McCune–Albright Syndrome—Clinical Features in a Nordic Pediatric Cohort. Front Endocrinol (Lausanne). 2018;9:96. Hart ES, Kelly MH, Brillante B, et al. Onset, progression, and plateau of skeletal lesions in fibrous dysplasia and the relationship to functional outcome. J Bone Miner Res. 2007;22:1468-1474. Chakraborty D, Mittal BR, Kashyap R, et al. Radioiodine treatment in McCune–Albright syndrome with hyperthyroidism. Indian J Endocrinol Metab. 2012;16:654-656. Salenave S, Boyce AM, Collins MT, et al. Acromegaly and McCune-Albright syndrome. J Clin Endocrinol Metab. 2014;99:1955-1969. Sallum ACR, Leonhardt FD, Cervantes O, et al. Hyperthyroidism related to McCune-Albright syndrome: Report of two cases and review of the literature. Arq Bras Endocrinol Metabol. 2008;52:556-561. Huang X, Jiang Y, Xia W. FGF23 and phosphate wasting disorders. Bone Res. 2013;1:120-132. Yao Y, Liu Y, Wang L, et al. Clinical characteristics and management of growth hormone excess in patients with McCune–Albright syndrome. Eur J Endocrinol. 2017;176:295-303. Brown RJ, Kelly MH, Collins MT. Cushing syndrome in the McCune-Albright syndrome. J Clin Endocrinol Metab. 2010;95:1508-1515. Gaujoux S, Salenave S, Ronot M, et al. Hepatobiliary and pancreatic neoplasms in patients with McCune-Albright syndrome. J Clin Endocrinol Metab. 2014;99:E97-101. Zacharin M, Bajpai A, Chow CW, et al. Gastrointestinal polyps in McCune Albright syndrome. J Med Genet. 2011;48:458-461.